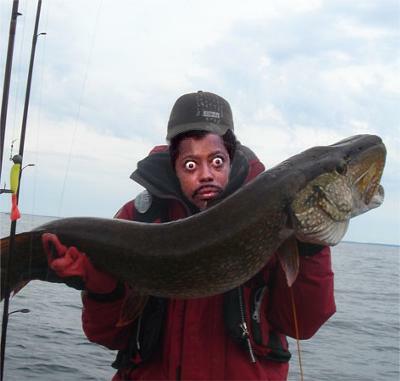 We was out fishing for catfish and we got this big surprise instead. Biggest pike I ever did see! I helped to get it in the boat. It was bigg. Dang son, may not be a carp but daggone that's a massive pike!!! That's crazy playa!! Too bad it ain't a Carp! were you fishin in that big water. with fishes like that I aint wanten to fish there. them things might bite you. man were you fishin in that big water? with big fishes like that i aint fishin in that water. you can get bit. Look at those eyeballs bro! With all due respect, are you looking like that because of the fish, or is that your normal look? hahaha I know that would be me if I pulled something like that out of the water. Big props on catching that big pike. Great picture.